On the 24th August 2007, AFM Records released the debut album by a brand new band called EDEN’S CURSE. Coming on like a cross between classic American bands Queensrÿche and Dokken, married with the European stylings of Pink Cream 69 or latter day Edguy, EDEN’S CURSE were warmly received by the global Rock & Metal press and public alike. Fast forward to January 2016 and EDEN’S CURSE celebrate a decade together and in October of that year they released their fifth studio album ‘Cardinal’ on AFM Records. To celebrate the tenth anniversary, AFM Records and EDEN’S CURSE hatched a plan to re-record the classic debut album in its entirety. “The first album really was the foundation for all that was to follow. Ever since Nikola joined the band we have been inundated with requests to re-record some of the older material and whilst it would be great fun, it would also be the same amount of work as recording a brand new album.” says bassist Paul Logue. Coupled with the re-recorded debut album is the ‘Live In Glasgow – Official Bootleg DVD’ which is the ‘Live With The Curse’ live album recording show in its entirety. Filmed at The Classic Grand in Glasgow on 28th November 2014, the release marks the band’s first official live DVD release, albeit in a bootleg form. “The footage is absolutely excellent” states bassist Logue. “We did not intend to film a DVD, but the audio recording company brought two cameras along to capture the show and when we saw the results we were really surprised!“ he adds. 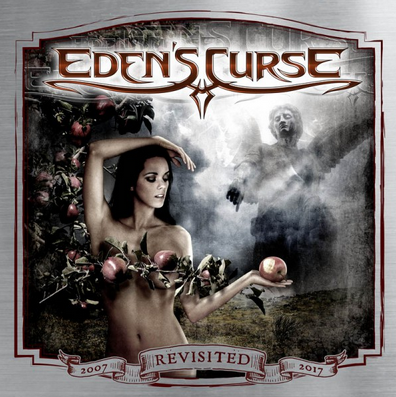 ‘Eden’s Curse – Revisited’ is the ultimate package for EDEN’S CURSE fans old and new and a fantastic introduction to the band’s music. It’s a true celebration of the record that started it all, from the guys who carry the legacy forward. Over 60 mins of music and 100 mins of film make ‘Eden’s Curse – Revisited’ a must have for all Eden’s Curse & Melodic Metal fans! This entry was posted on June 28, 2017 at 5:00 pm and is filed under Hard Rock, Heavy Metal, Music, music news, news, rock music, world news with tags eden's curse, Hard Rock, heavy metal albums 2017, metal odyssey, Power Metal. You can follow any responses to this entry through the RSS 2.0 feed. You can leave a response, or trackback from your own site. I liked this album when it came out. Not sure I care to hear it with the new singer though. Can’t believe it has been 10 years already.